Tumble dryers are one of life’s luxuries that attract controversy. 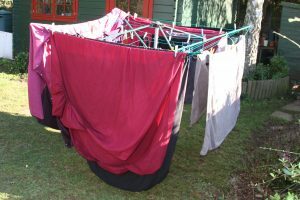 Unless it is raining or too cold, the zero carbon and zero cost option to dry clothes is to hang them on an outside line or indoor drying rack​. However many people are too lazy to make the effort, so here EcoFrenzy shows you how to save money, energy and the environment even if you decide to use your tumble dryer. Using an outdoor line or indoor rack will save energy and money whilst also reducing fabric wear. cost you just under £53. A heat pump condenser tumble dryer may cost more than a standard condenser dryer to buy but could give you electricity savings of up to 50%. If used 150 times a year for 1 hour this could mean savings of £27 = 70kg of CO₂. An A++ rated tumble dryer may use 230 kWh of electricity per annum compared to a C rated model which may use 580 kWh. The potential cost saving per annum is £49 = 165kg of CO₂. When purchasing a new tumble dryer, search for these money saving and environmentally friendly features. The moisture sensor automatically stops the drier when the clothes are dry. Dryers with a ‘cool-down’ period also save energy. Choose a ‘perma press’ (cool-down) cycle. No heat is supplied in the last few minutes, but drying continues as cool air is blown through the tumbling clothes. Very efficient as they recycle the heat from the ventilation tube back into the dryer, but take away the water vapour from the air. ​Buy a tumble dryer with the best energy rating you can. The most efficient models carry the A++ grade, the least efficient C.
Choose a tumble dryer which lasts the longest with the lowest power requirements – this might cost more initially but may save you money over the lifetime of the appliance.